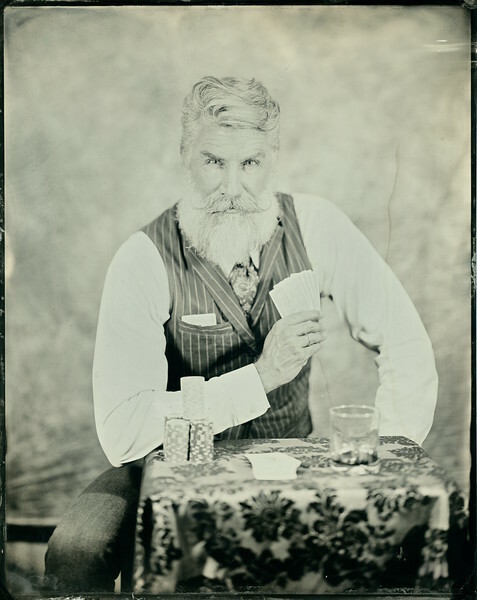 Wet plate collodion is one of the earliest photographic processes discovered in 1850 by Frederick Scott Archer in the UK and practiced for about 35 years before being replaced by dry plates. The earliest photographs of the USA were captured by William Henry Jackson. Matthew Brady and his photographers used this process to capture images of the American Civil War and many still remain today. 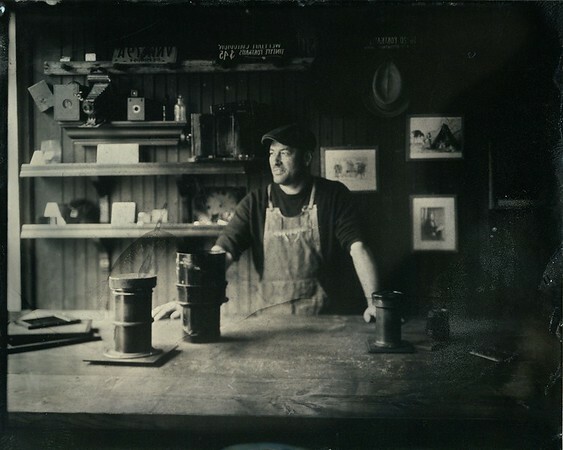 This is a chemical process that utilizes collodion, silver and light to create an image on either a metal or glass plate. The plate must stay wet through the entire process to be successful. Each plate is always unique and is a product of many variables such as temperature, humidity, light, chemical formulas and techniques to list a but a few which makes it challenging to master. Once created the plate is essentially an original physical work of art - a copy of the truth that can’t be changed or reproduced, and if taken care of can last hundreds of years. The surreal raw quality can’t be matched by any digital process today. The entire process takes about 30 minutes per image and has several steps. Approx 20 minutes per image. How long do I have to stay still for? With modern strobes less than one second. Using outdoor light can vary depending upon the time of day. Can I watch the process? If you come to the studio you may join me in the darkroom if you wish to learn more about the process see your image develop. What can I expect in the session? I enjoy sharing the process and this amazing experience with all my clients. I guarantee you will never forget having your portrait taken! After you arrived and we have met and settled I will pour collodion on the plate and begin sensitization in silver which takes about three minutes. At this time I will compose the picture and ensure lighting is configured. Once we are set on the composition I will retrieve the plate from the silver bath and bring it to the camera. I will then take the shot and using strobe takes under a second. After a big flash I will then take the exposed plate to the darkroom and develop, wash and reveal the image with fixer. You are invited to video the fixing which is an exciting part of the process. Once the image is fixed and washed it is dried and then varnished to seal it from the environment forever. You are able to take it home on the day. What sizes and materials do you offer? I offer several options for portraits. Firstly you can select what material you would like your portrait to be taken on. Glass (Ambrotype) - this is more expensive as it is labor intensive, and also the cost/availability of certain glass. I offer clear and also colored glass such as black or ruby. Glass plates are a premium product. Once you have decided on the material then you can decide of the size image you would like. The majority of clients request the 8x10 format. For those who want something truly unique stretch to the 16x20 inch plate which is a rare format and allow me to capture a person 1:1 ratio lifesize! Please visit the booking page to see current pricing. I use large format cameras with large lens to capture detailed portraits. The ages range from 1900 to 2017. I am located in Hamilton Square, NJ and I am flexible with session times. Yes I can come to you for an additional fee based on distance. Yes I do special events e.g. weddings where I would be in addition to a regular photographer and also historical events, charity events. Just contact me and we can discuss your requirements. I am able to give a discount for large numbers of plates.